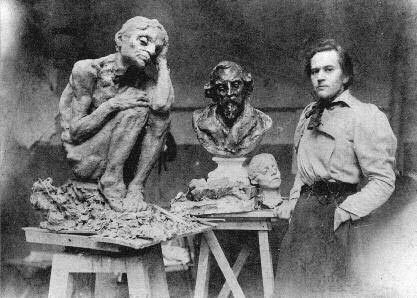 The sculptor Anna Golubkina is an outstanding Russian artist of the turn of the 19th and 20th centuries. 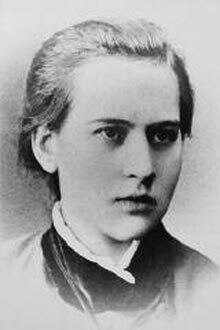 Although her work has always been the subject of scholarly study, there still remains much to learn. An unexplored but distinctive and unexpected phenomenon in Golubkina's art — she generally gravitated towards monumental forms of sculpture — is represented by her cameos, made from seashell and ivory. Initial efforts to estimate the total number of these miniatures, which were created over many years, and understand their significance in Golubkina's work, led to the conclusion that carving cameos was a modest "parallel" occupation which existed alongside her more renowned and innovative work in sculpture. The diverse range of materials and techniques which Golubkina used in her small-scale creations, as well as the breadth of her artistic vision (with virtually every work amazingly original) are a testament to the highest degree of her creative freedom. 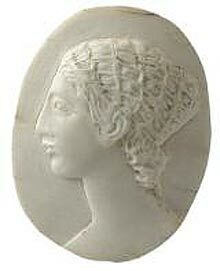 It is worth noting that Golubkina, whether she was carving ivory or seashell, remained first and foremost a sculptor. Sometimes, the sculptor's strong temperament emerged through the smooth, harmonious lines of her miniature creations, betraying quite unambiguously the author's manner, the signature of their creator. Ivory was one of the artist's favourite media. 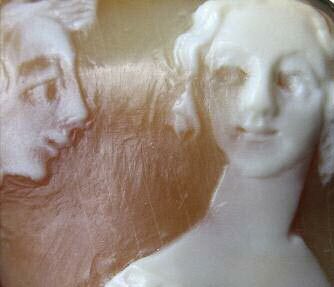 It is possible that working in that form made up for the frequent intervals when, due to lack of funds, Golubkina was unable to work with her beloved, majestic marble, a material so technically different from ivory, but equally delightful, white and pure. 18 of Golubkina's ivory cameos survive; it is clear that there were many more made. The question is when they were created. Golubkina's cameos reveal much, and direct our thoughts in the right direction. Three stand out — "Mitya", "Borzois" (Wolfhounds), and "Maximilian Voloshin. Caricature Portrait" (all of the 1910s (? ), Tretyakov Gallery). We believe that the artist carved them significantly earlier than the ones she created after she had met Bobrova and mastered modern techniques of working with ivory. 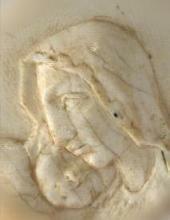 They are set apart from her other works by a noticeably higher relief, and a somewhat heavy modelling of the lines. The way Golubkina uses her carving tools is reminiscent of wood-carving techniques. It is clear that the first two are versions of her marble sculpture "Mitya" (1913) and "Dogs" (1913), both made of limestone (Tretyakov Gallery); the heartbreaking subject of her young nephew Mitya's untimely death is also the theme of Golubkina's limestone bas-relief "Mother and Child", a gesso mask, and drawings executed during the same time (all after 1913, Tretyakov Gallery). The three borzois in the cameo obviously match the dogs in the bas-relief "Dogs". 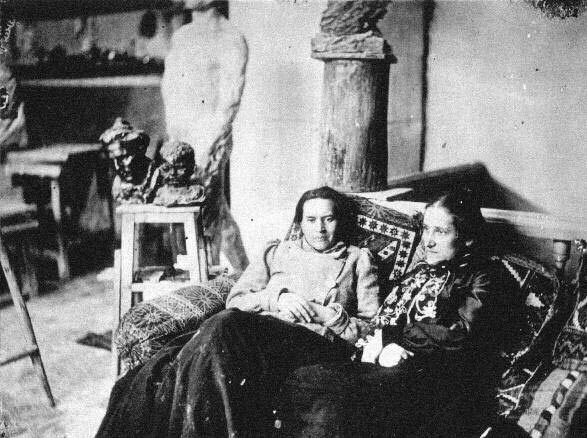 They are also known to represent the dogs which belonged to Natalya Kusevitskaya, who lived in Glazovsky Lane, next to Golubkina's studio, and who in 1912-1913 took sculpture classes from her. The artist's distinctive style and manner, the intertwining motifs of these works, lead us to believe that the cameos "Mitya" and "Borzois" are linked to particular events, representing variations of thematically related works of art, and were all created at about the same time, in the early 1910s. I believe that the cameo portrait of Voloshin may have also been carved at about the same time. The sculptor and the poet met when Golubkina was studying in Paris with Auguste Rodin, and developed a warm friendship. However, it would seem that the most important event of their companionship was the 1911 publication of Voloshin's article about the sculptor's art in the "Apollon" magazine2; the article was the first one to provide a comprehensive and profound examination of Golubkina's oeuvre, as well as a review of her innovative plastic expression. The article was published three years before Golubkina's first solo exhibition at the Museum of Fine Arts, which took place in 1914. 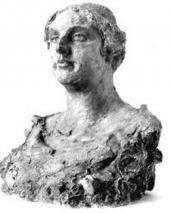 Golubkina clearly did not intend to put up for sale either her cameo portrait of Maximilian Voloshin or her cameo "Mitya"; it is likely that Voloshin's portrait was meant to become a gift to the author of the "Apollon" article. In the museum world, this miniature cameo is known as "Maximilian Voloshin. Caricature Portrait". Such a definition of the cameo's genre usually leaves the contemporary viewer bewildered: it does not match the generally accepted, though not entirely correct, idea that Golubkina's art has a tragic tone to it. Even among her cameos, there is at least one more portrait with an obvious "caricature" feel — "Portrait of V.V. Trofimov" (1920-1923, Tretyakov Gallery), where she depicts her subject with his cat crouching on his shoulder. The artist did not like cats, but often depicted them in her art, in their various "guises". Trofimov's cat is staring at the viewer, eyes wide open. In his master's arms, the cat comes across as a sweet fluffy thing, but no doubt the artist hints at the real nature of this freedom-loving creature, always prepared to break up the illusion of tranquillity and harmony. While the incongruous nature of the Trofimov portrait is quite apparent and easy to see, it is hard to figure out the "caricature" meaning of Voloshin's image, unless the viewer is familiar with the context and traditional representation of the writer's image, whether by his contemporaries or himself. We should remember that Voloshin was one the most frequently depicted figures of the Silver Age, as well as later eras. There were at least two iconic ways of rendering the image of this writer-poet-artist: one is the traditional "old Russian" (in those portraits Voloshin looked like a character from the plays of Nikolai Ostrovsky, or a senior church figure, even maybe a coachman) and the "classical" (antique) one, which he himself liked better than the first. In Voloshin's early self-portraits, which he drew before 1910, there is just a suggestion of the future "classical" renditions — those images were more often reminiscent of caricatures. 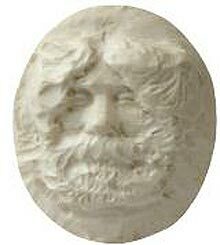 It is possible that Golubkina appreciated the latter artistic vision, and when she carved her own portrait of Voloshin in the early 1910s, it came out somewhat reminiscent of the dancing Voloshin's face from his own drawing (c. 19033). 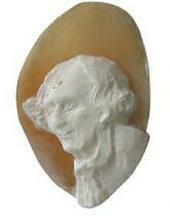 Had the sculptor been contemplating this portrait in the 1920s (by then "the Koktebel visionary" was firmly associated with classical and Biblical images in his contemporaries' minds), she would have not chosen ivory as her medium, but rather the multi-coloured seashell, which would have echoed the poet's numerous watercolour portraits, so popular at the time. Portraits hold as special a place in Golubkina's cameos as they do in her entire oeuvre. Some of them stand alone, like the portrait of Voloshin; some are the extension of the master's prior reflections. 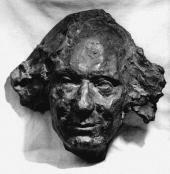 Thus, Golubkina carved her seashell portrait of Vyacheslav Ivanov (1920s,Tretyakov Gallery) — a Silver Age poet and philosopher whom she admired — after she had already finished working on his mask and a sculptural portrait; her contemporaries compared the powerful impression from this sculpture to that of Beethoven's (both of 1914, Tretyakov Gallery). 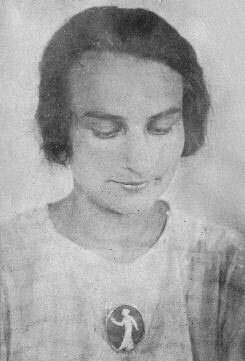 Next to the portraits of famous and recognizable figures of her era, Golubkina created miniature images of her relatives, friends and acquaintances. 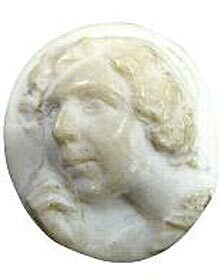 Sometimes a carved female head reminds us of N. Giatsintova's profile, familiar from a relief medallion of 1900 (Tretyakov Gallery), or the faces of the Alekseev sisters, Nina, an actress, and Lyudmila, a dancer, the artist's lifelong friends. Golubkina's genre and multi-figure compositions sometimes include an even more unexpected web — or just a glimmer — of familiar characters. 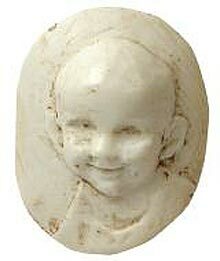 Thus, a number of seashell carvings depict a boy on a bird (a swan or an eagle), whose features are quite similar to those of Mitya, the artist's little nephew; the child is sometimes portrayed as the mythical Ganymede ("A Boy on the Eagle Wings", 1920s, Golubkina House-Museum in Zaraisk), sometimes as a hero from a folk fairy tale ("A Boy on the Swan", 1920s, private collection). 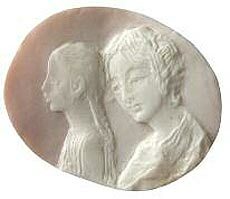 We could also speculate that two of Golubkina's students, Zinaida Klobukova and Tatiana Ivanova, became the inspiration for the image of Margarita in her cameo "Faust and Margarita" (1920s, private collection). 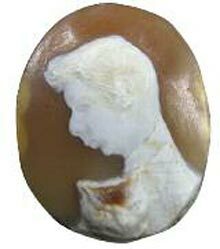 The sculptor admired both young women for their youthful and pure beauty; her admiration shines through the masterfully refined outline and the delicate, beautiful interplay of the seashell's honey and ochre hues. It is more fitting to look at Golubkina's cameos in the context of her entire body of work, and not as an unrelated "hobby". This continuity found admirable expression in the recent exhibition "Anna Golubkina. 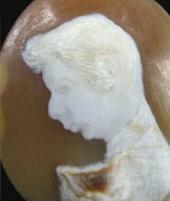 The Art of Cameo" at the Golubkina studio museum4 (end of 2011- beginning of 2012). This was the first exhibition where Golubkina's cameos were presented alongside her bas-reliefs, sculpture and graphics; this approach clearly revealed an aspect of her art which had not been given serious consideration before — the original, experimental focus of this small-scale, intimate part of the sculptor's work. Golubkina's innovative approach revealed itself in her distinctive technique of carving ivory and seashell, which combined traditional ways of working in this medium with bold creative discoveries, as well as in her choice of motifs and the way she rendered her images. Whether a cameo portrait, a miniature landscape, a multifigure composition, a genre scene, or a religious image — each was based on a new idea, a breakthrough of creative thought, an intense focus of the artist's will from an individual used to working with large-scale sculpture. Not coincidentally, many of Golubkina's cameos exhibit the properties of large-scale works of art, and do not lose their expressiveness even under considerable magnification; at the same time, they retain the qualities of miniature art as they entice the viewer to admire them, to look closer, to reflect. 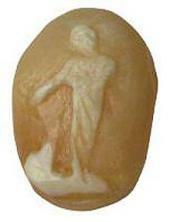 Even "The Sower" (1920s, Tretyakov Gallery), the smallest of the cameos (its height barely more than one centimetre), has all these qualities, but also "tempts" the viewer to take it into his or her hands, as if hinting at a hidden meaning which could only be unveiled through involved and careful examination. It might seem that there was nothing new to be discovered in the theme of "the sower", which had been a popular subject for centuries. What drove the sculptor to seek the exquisite miniature shape in the fragile seashell after the peasant sower from Van Gogh's paintings (June, 1888, Kroller-Muller Museum, Otterlo; or "Sower", November 1888, Vincent Van Gogh Museum, Amsterdam) had become legendary among her contemporaries, and after the appearance of the golden chervonets (the first coin minted in the Russian Federation in 1923), with the famous figure of a sower based on the sculpture by Ivan Shadr (1922, Museum of Modern History of Russia, Moscow)? It seems that in the symbolic figure of the sower in Golubkina's cameo, whose rhythmic, plastic movement captivates the viewer with its harmonious perfection of a ritual dance, we can discern the image of Christ the Sower. The study of Christ, a topic which deeply touched the sculptor in the 1910s, was revealed in a number of Golubkina's works, the most significant being "The Last Supper" (1911, Tretyakov Gallery). In the image of the sower, this subject also found its way into her cameos of the 1920s; it did not become a part of the Gospel series but rather of another theme, also central to the Christian tradition, attesting to predestined rebirth after death. Golubkina's depiction of Christ the Sower was not canonical from the point of view of Russian Orthodox iconography. The sculptor seemed to be following Kuzma Petrov-Vodkin's artistic vision as represented in his large-scale mosaic of the same title (1915) in the Erlanger family crypt at the Vvedensky (German) cemetery5 in Moscow. Through the soft, fading, generalized, and perfect image of the Sower, Golubkina developed the tradition of the classical and ancient Oriental art of cameo. It is worth noting that while Van Gogh's paintings were filled with images of sowers at the beginning of his artistic career, and scenes of harvesting at the end of his life, it was the other way around for Golubkina: the rival notions of "life and death", "beginning and end" developed in the opposite direction. While still a student at the Moscow School of Painting, Sculpture and Architecture, she created her harvest-themed bas-relief "Death's Harvest" (1892-1893, whereabouts unknown), which left both her fellow students and her professors stunned. However, during Golubkina's very first decade of independent work as an artist, she lived out, thought through and rendered in sculpture the theme of old age and the end of life. As we can see, by the 1920s, notwithstanding her failing health and financial difficulties, the sculptor found peace of mind and received a powerful new creative impulse. At this time, Golubkina's plastic expression gravitates to classical finality and clarity, while convincingly demonstrating the originality of the sculptor's artistic approach and forms of expression. 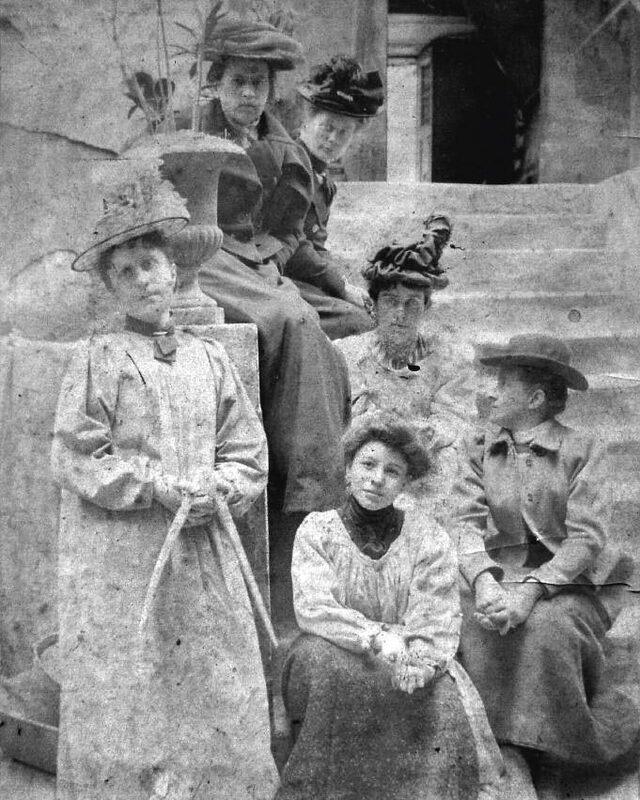 Her contemporaries noted that during the last years of her life, before her early death in 1927, everyone noticed "a significant shift in her moods towards a brighter disposition. Her deep sadness left her, she was active and energetic. One plan after another excited her. 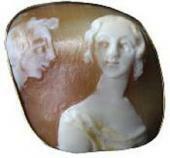 "6 It cannot be ruled out that the secret of this revival was at least to some extent in the new, small plastic form which the sculptor turned to during the difficult 1920s, in mastering new techniques of carving ivory, and in "conquering" an unpredictable new medium, the seashell — the medium from which she would go on to carve more than 40 cameos in just a few years. The drawing was published in 1990 (whereabouts not indicated). Ref. : Kupchenko V., Davydov Z. Maximilian Voloshin's Self-portraits. In: Literaturnaya ucheba. Book 4. July - August. Moscow. 1990. P. 168. Now the Anna Golubkina Art Research Department of the Tretyakov Gallery. There is no doubt that the sculptor was familiar with this innovative work by Kuzma Petrov-Vodkin at the Vvedensky cemetery. In 1912, Golubkina executed a marble bas-relief with the image of Christ for the Fetter family crypt, which was erected after 1914 in the centre of this cemetery, close to the Erlanger memorial headstone. Anna Golubkina with a group of artists. Anna GOLUBKINA. Mother and Child. 1920s.